A beautifying blend of botanical infused carrier oils, restoring organic essential oils; formula provides nourishment & renewal, softens and brightens the skin. The ingredients are sweet almond oil, tamanu oil, castor oil, rosehip oil, and dried calendula. I’ve only ever had one experience with a cleansing oil, which was the L’Oreal Sublime Radiance Sensational Cleansing Oil. I happen to really enjoy it but I only use it on days when I need something heavy duty to remove my makeup. The Birchrose + co cleansing oil is completely different in that it contains mostly essential oils that are derived from plant-based materials, whereas the L’Oreal cleansing oil is primarily made with parraffinum liquidum (aka mineral oil). Because of this, I made sure to do a patch test in order to determine whether I would develop an allergic reaction to the product before I used it because sometimes the more fragrant essential oils tend to trigger them. Thankfully, no reaction occurred. In terms of the packaging, I think that the simple glass bottle looks very beautiful and minimalistic, however it isn’t the most practical given that the product tends to spill out and drop down the bottle as you pour the oil out onto your hands. It’s not a major problem, but it certainly can get annoying. The oil has a herb-like, mildly citrusy scent that isn’t very strong. It’s not faint by any means; it just isn’t one that lingers. The oil itself is very smooth and silky, just as one would expect an oil to feel like. In terms of the application, all I do is apply a quarter-sized amount of oil onto my palms, then I massage the oil onto my dry, uncleaned face. I massage the oil all over for about one minute. As I’ve mentioned before, my only experience with a cleansing oil was with the one made my L’Oreal, so I assumed that I could just do what I usually did with it and use some water to mix in with the oil, massage some more to create an emulsion, and wash it off with water. That was not the case with the Birchrose + co oil – the oil does not emulsify with water, so it cannot simply be rubbed off and washed off with water. 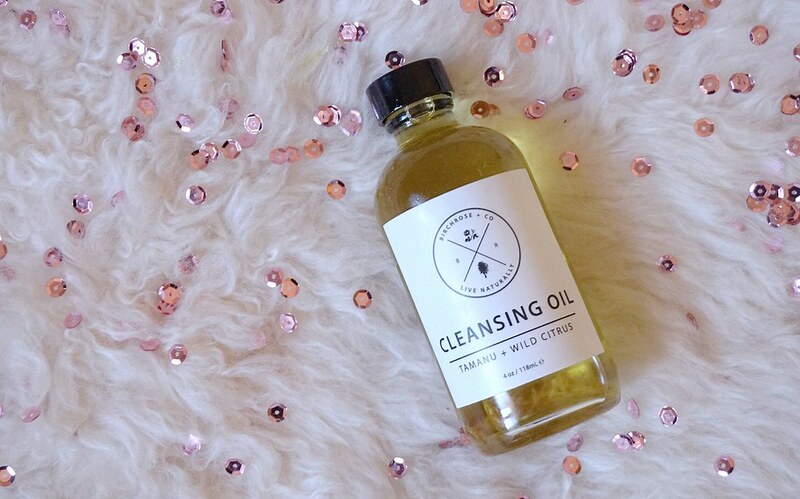 When I tried using the oil a second time, I actually read the instructions and became a little more familiarized with the ever-so popular Oil Cleansing Method (OCM). I applied the same amount, massaged it all over my face, but this time I soaked a face towel in hot water, wrung it out, then draped it over my face until the towel cooled down. I repeated this 2 more times, then I gently wiped off my makeup using the other side of the towel. After I wiped my makeup off, my skin looked and felt so soft and supple. The oil did a wonderful job of lifting all the dirt and makeup off my face, however my eye makeup did not completely come off. I went in with some face wash after wiping the oil off to remove any residual oil and makeup. I used this oil every other day for the last couple weeks and I did not experience any breakouts, rashes, or any other signs of irritation. My skin always felt smooth and looked very radiant every time I used this product. Overall, I am definitely a fan of this product. I think it does a great job of cleansing the face and doing the heavy duty work whenever I wear a heavier face of makeup. At the same time, I find it to be very gentle on the skin. I really enjoy the aromatherapeutic sensation the oil gives when you’re waiting for the hot towel to cool on your face – it’s quite relaxing! I also loved how it didn’t irritate my skin at all, which I’ll admit I was a little worried about when I first received the product. It’s definitely a huge bonus that the product uses natural and organic ingredients, although I will say that it’s not really something that I consider whenever I buy beauty products. I also find the oil to be very hydrating. I mentioned that I used a second cleanser to remove any remaining traces of oil and/or makeup on my face, however if you don’t really wear much makeup or have extremely dry skin, I think that using the oil would be more than enough to cleanse the face. All in all, I definitely recommend this product. If you happen to live in Canada, I also highly recommend ordering it from Malachite + Elephant. They have wonderful customer service and their shipping is lightning fast. If any of my lovely readers are interested, Malachite + Elephant has kindly given me a 15% off discount code which can be used to buy anything on their website: GIRLANDVANITY15. Note: This product was received as a complimentary item from Malachite + Elephant for my consideration. In addition, I was not required to write a review on this product. I also did not receive any compensation for this review and will not be receiving any compensation for the discount code that was provided to me.